I used to be a basic cook, following recipes as written. My mother was a Home Ec major in college, and she taught my sisters and me how to cook (and sew, and needlepoint, and …). She worked for an ad agency styling food after graduating, and also worked in a test kitchen at one time. I was making a trifle to take to a party. I thought about using Angel Food cake, and then thought about how to give it some texture. The macerated berries don’t have the same mouth-feel as the pastry cream, but they’re both soft. I thought about making croutons with the cake, and how delicious the crispy, toasty cake would be when it was combined with vanilla pastry cream and macerated berries. The grocery store was out of Angel Food cake – the price of eggs had made it temporarily unavailable. What to do? I now had the hankering for cake croutons. I thought about making a pound cake, but decided convenience was the way to go. I bought a frozen pound cake, took it home, and made the croutons. Try making them sometime – they amp up dessert, and you could do this with slices if you wanted to speed up the process. Cut the pound cake into bite-sized pieces. If using a frozen pound cake, defrosting it is optional. Combine all ingredients in a large mixing bowl, and toss gently to coat all pieces of cake with butter and sugar. On a large baking sheet, spread out the pound cake into one layer. Put into preheated oven and bake for 20 minutes or until golden and toasted, turning it occasionally. Once the cake is golden brown, remove from the oven and cool completely. I usually transfer it to a different baking sheet so it stops cooking and cools faster. You can use these immediately, or cool completely and store in an airtight container. 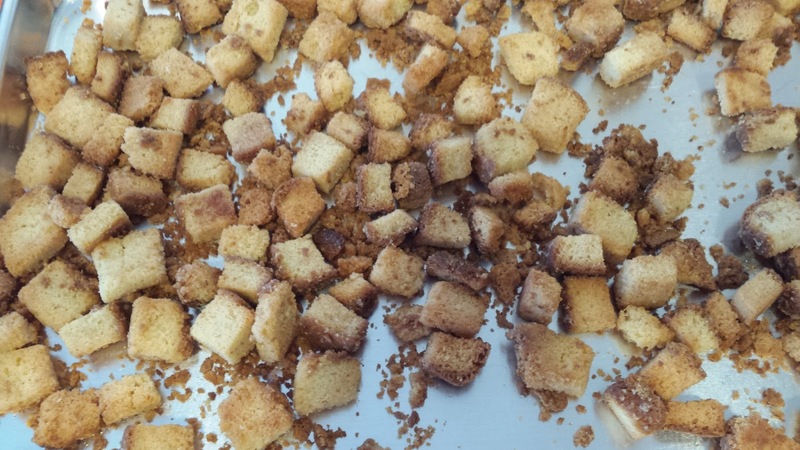 These Pound Cake Croutons added the right amount of texture, and came out just as I had hoped they would!